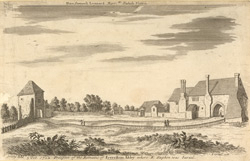 Faversham Abbey was founded in 1148 by King Stephen and Queen Matilda. The site was just to the north east of the town, where the playing fields of the Queen Elizabeth's Grammar School are now. 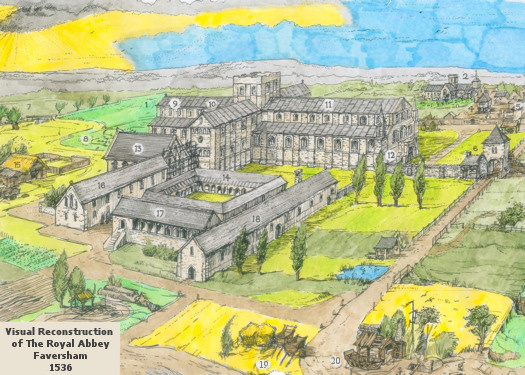 Reconstruction of the abbey as it would have looked in 1536, courtesy of Jack Salmon. A key to drawing is in Details of the Abbey, below. The aim of Stephen and Matilda was to found a royal mausoleum for the House of Blois. They hoped the dynasty would rule over England for generations to come. In fact it began and ended with them. The abbey was dissolved in 1538 and subsequently most of it was demolished as part of Henry VIII's plans to sweep the monasteries from England. Much of the building material was removed by military engineers and transported by sea to France, where it was used to strengthen the fortifications of the towns in the Pale of Calais, which at the time was England's continental bridgehead. and about this time the refectory was dismantled and its timber re-used to create a long warehouse that still stands at Standard Quay, near by. Not long afterwards the final traces were removed and the exact site of the once famous establishment sank into oblivion and was lost. Among the few surviving buildings of Faversham Abbey are the two barns at Abbey Farm. The smaller (Minor) barn dates from 1425 and the larger (Major) barn dates from 1476. In the farmyard of which they form part there are other listed buildings including Abbey Farmhouse, part of which dates from the 14th century, and a small building which is thought to have been the abbot's stable. Also surviving is the abbey guest house on the east side of the outer gateway of the abbey, now known as Arden's House. This house, now a private residence in Abbey Street, was the location of the infamous murder of Thomas Arden in 1551, the story of which is told in the play Arden of Faversham. Globe House opposite is thought to have been the abbey steward's home. King Stephen, in 1154, his wife, Matilda in 1152, and son Eustace, in 1153, were all buried in the abbey church. When it was excavated in 1964, their empty graves were found close to the very centre of the quire. Their bones are said to have been thrown into Faversham Creek when the building was dismantled. However, in the nearby Faversham Parish Church of St Mary of Charity is a canopy tomb with no contemporary inscription, where, it is said, their bones were re-interred. Excavations of the site have revealed the church had a total length of about 360 feet; the long nave was flanked by north and south aisles in the usual manner and gave a total width of nearly 80 feet. The nave joined the large transept under a massive central tower, the foundation sockets of which took the form of large rectangular pits. From here the chalk foundations of the choir, still with aisles to north and south, ran eastwards to end in a large apse. This was flanked by two smaller apsidal foundations which terminate in aisles. Four more small apses existed on the transept arms. The picture was drawn by Jack Salmon of the Faversham Society, black and white copies of which, suitable for colouring by hand, are on sale at the Fleur de Lis Heritage Centre. 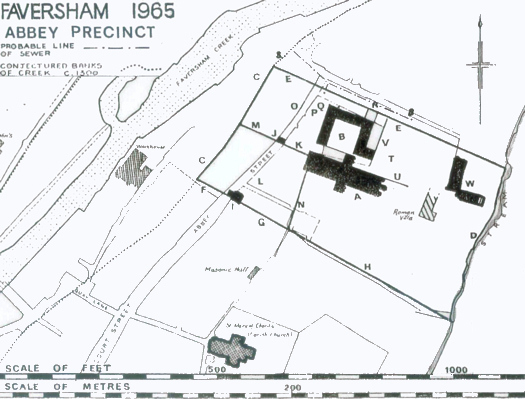 Plan of Faversham Abbey drawn by Brian Phelp, of the Council of Kent Archaeology, after his 1965 excavation of the site. The Abbey precinct was about 7.719 acres. Faversham Abbey was linked with a bizarre belief about the barnacle goose (Branta leucopsis), a winter visitor to Britain from the Arctic. The bird takes its English name from having been supposed, as late as the 17th century, to be born in barnacles attached to timber on seashores. Handily, this meant the birds were not flesh, but fish, and could be eaten by Roman Catholics during Lent. However, barnacle geese were hard to find. In about 1211 Gervasius of Tilbury, in his Otia Imperialia, highlighted the "fact" that near Faversham Abbey were willow seedlings from which sprouted buds, in which small birds formed. If the seedlings were shaken, the nestlings would "fall into the sea" and mature. Confusingly, the Latin name of the brent goose is Branta bernicla, seemingly because brent geese were often thought to be barnacle geese.